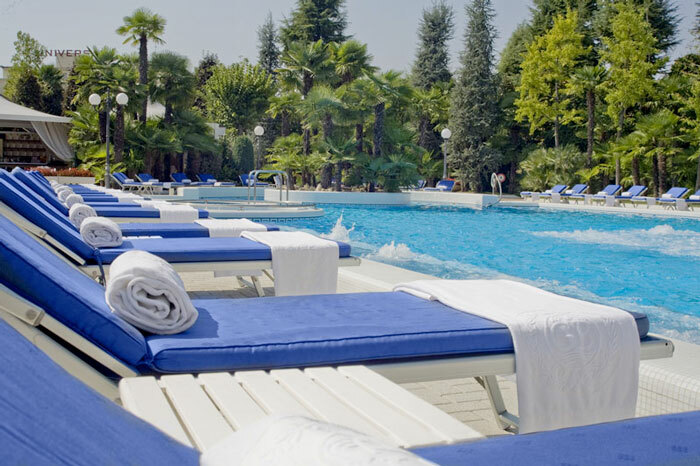 Location: The Abano Grand Hotel is the only luxury 5-stars hotel, located in the heart of the well-known thermal town of Abano, with the most innovative spa resort equipment in the area. Although it is “just a few steps” from the pedestrian quarter, it is surrounded by beautiful gardens with rich olive trees, palms and tropical plants. Description: The hotel is surrounded by a 20,000 sq.m. garden. populated by olive trees, palms and tropical plants that create an oasis of peace and tranquillity. Being the newest resort of the area, its structure reflects the most modern principles of hotel technology dedicated to health and well-being. Stunning decorations, elegance and luxury are the hallmark characteristics of this extraordinary Palace. As soon as they enter, guests first notice the hotel’s extraordinary design. The stately hall is rich in works of art which create an elegant and refined milieu. 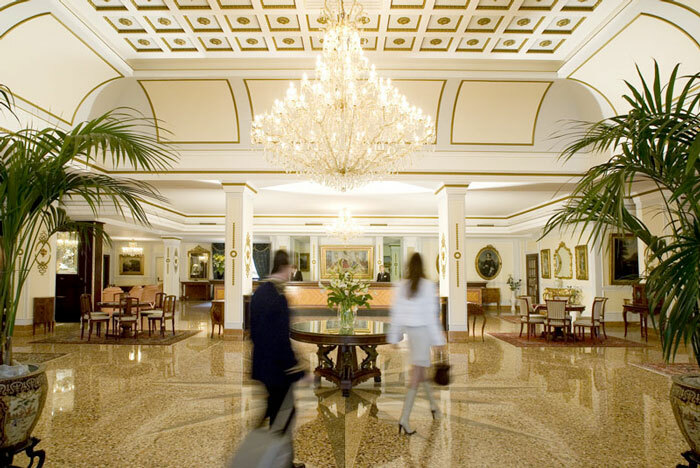 From Venetian marble to antiques to fine paintings, in every corner, all details are perfect. 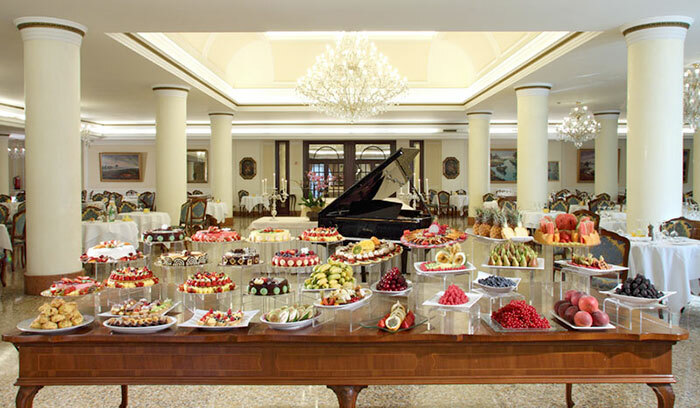 Catering: The exquisite Pietro d’Abano Restaurant offers the Grand Cart Menu with Regional and International cuisine. The Etoile Restaurant, placed near the outdoor swimming pool proposes during the summer a large choice of fresh fruits, season fruits and tropical fruits. The Anti-aging Thermal Spa: The refined Thermal Spa offers a wide range of services and treatments which include three thermal pools, one indoor pool connecting with two pools outdoors with different temperatures between 33 and 36 degrees, equipped with jacuzzi, whirpool and Kneipp path, a fitness room, a thermal steam cave, courses of aquagym, Do-In and Pilates. The Anti-Aging Thermal Spa offers exclusive anti-aging programmes for health, beauty and wellness care, aromatic thermal baths, inhalations and rehabilitation. Sports, oriental, anti-stress and invigorating massages, reflexology. Check-up of skin ageing and a stress oxidant test. 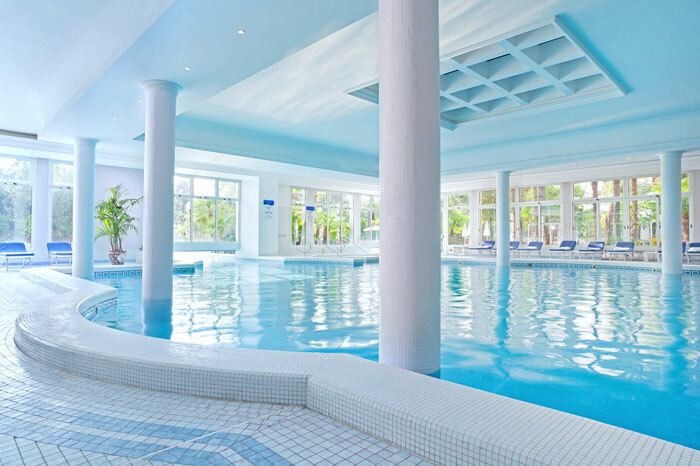 Innovative treatments, such as GB Luxury Hematite and GB face antistress, are the fruit of the thermal research carried out by the medical team of GB Thermae Hotels. Test of food intolerance and personalised dietary menu are specially created considering food allergies. The Hotel features 187 guest rooms of different categories – deluxe, deluxe panorama, junior suite, imperial suite and presidential suite. The rooms are all very spacious and newly built. Precious marble baths with all the amenities: bath and shower, hairdryer, telephone. The finely furnished rooms: mini-bar, individually controlled air conditioning, direct-dial telephone, radio and television with satellite private safe. Internet connection to broadband. Depending on the location of the rooms, there is a balcony or terrace and panoramic views. Deluxe Panorama (53 sq.m.) 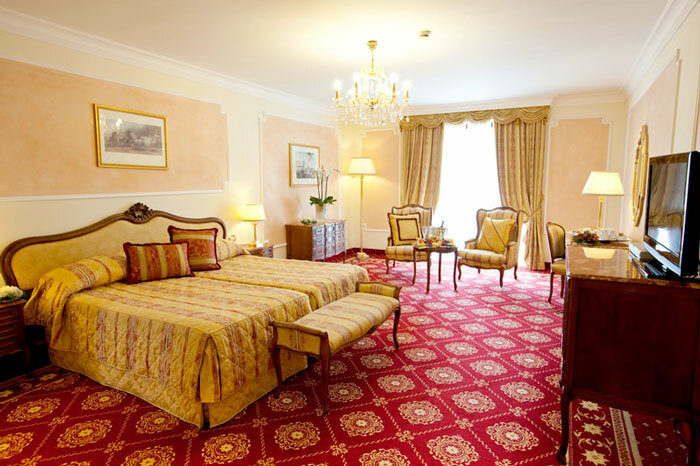 - Spacious rooms with the interior in the style of Louis XV, bathrooms, Italian marble, with bath and shower. Double or Twin rooms with a spacious balcony overlooking a park with swimming pools and the Euganean Hills, free internet access. Junior Suite (60 sq.m.) - Exquisite suites with the interior in the style of Louis XVI, spacious bathrooms, Italian marble, with bath and shower. Rooms are located in the northern part of the building, have a spacious balcony with city views, free Internet access via Wi-Fi, spacious wardrobe. Junior Suite Executive (60 sq.m.) 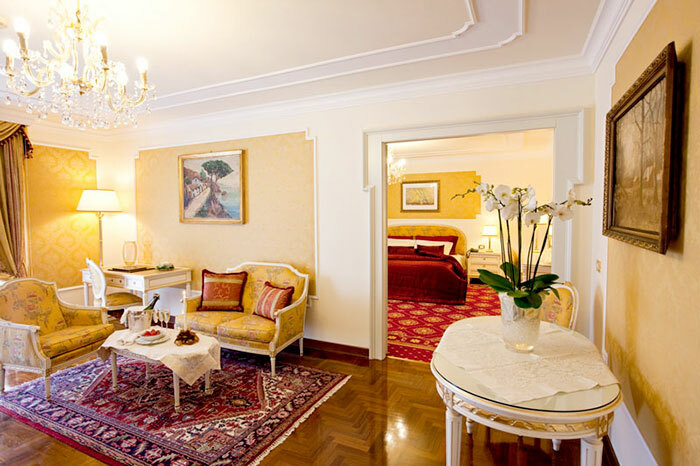 - Exquisite suites with the interior in the style of Louis XVI, spacious bathrooms, Italian marble, with bath and shower. 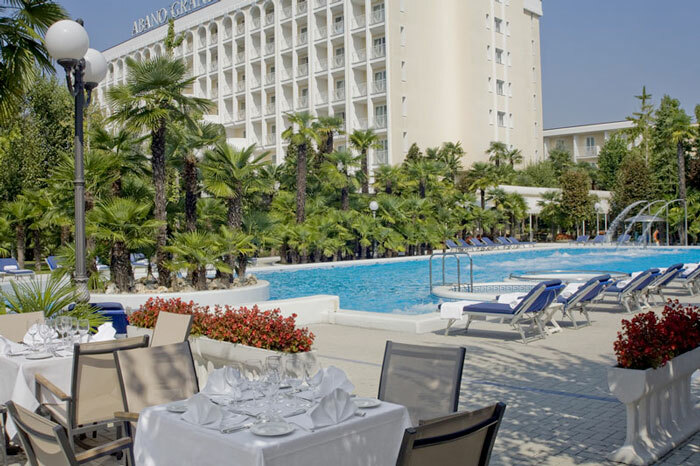 Rooms are located in the southern part of the building, have a spacious balcony with spectacular views of the park with swimming pools and the Euganean Hills. Rooms with en-suite bathroom and a guest toilet (on request). Free Internet access via Wi-Fi; spacious wardrobe for clothes. 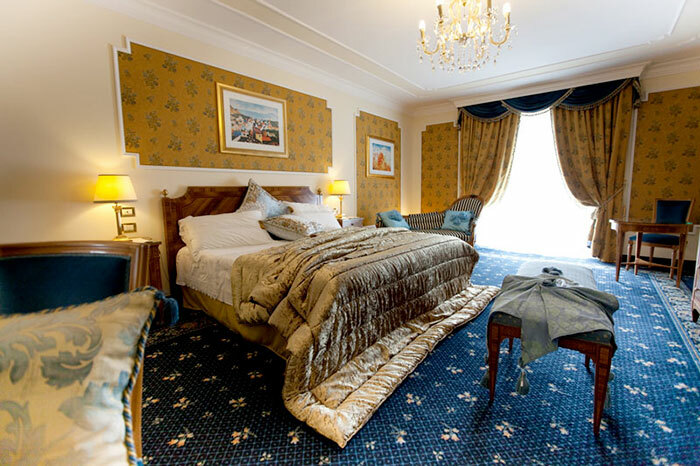 Imperial Suite (90 sq.m.) - Fine-bedroom suites with a total area of 90 sq. m., the interior in the style of Louis XVI, spacious bathrooms, Italian marble, with bath and shower. Small separate dressing room; living room with hardwood floors and a decorative fireplace; bedroom, separated from the living room door. Imperial Suite rooms are located on the upper floors (from 4th to 7th floor). Presidential Suite (107 sq.m.) - Fine-bedroom suites with the interior in the style of Louis XVI, spacious bathrooms, Italian marble, with bath and shower. Hall and guest toilet; living room with hardwood floors and a decorative fireplace; bedroom, separated from the living room door. Dressing room Bathroom with tub and shower, as well as toilet area.